Interview: Alaska Thunderfuck on RuPaul's DragCon "Breaking Down Gender"
The RuPaul's Drag Race All Stars 2 winner was dressed in a gorgeous male drag ensemble for Friday preview night. Musician and drag queen Alaska Thunderfuck and her team were kind enough to give us time for an interview at RuPaul's DragCon LA 2018. We touched on the event's meaningful nature, its featured set pieces from RuPaul's Drag Race, and the possibility of a second album from the AAA Girls (Alaska, Courtney Act and Willam's drag supergroup). Derek: What does DragCon mean to you? 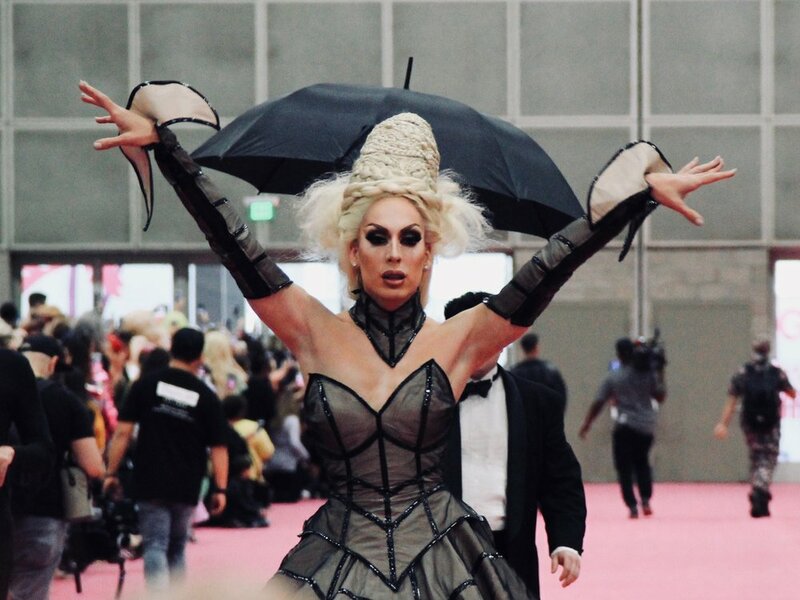 Alaska Thunderfuck: I love DragCon so much, and since it started I thought, "this is going to be huge," because it gives people a place to come together where we are breaking down gender a little bit. We can be ourselves and can express ourselves - and literally everybody is so happy today. I’m so happy to be a part of it. D: Yeah! What are you looking forward to this year? A: I’m really excited that the Werk Room is here and the judging panel. I’ve always wanted to sit at that table, so... now I get a chance! I’m really excited. D: Do you think you would put your other albums out on vinyl? A: I’m not opposed to the idea... I’ll say that much. D: Oh yes. Yaaas, honey! We love the AAA Girls album. That must have been fun to make. A: It was really fun. D: Is there going to be a second one, do you know? A, coyly: I don’t know... stay tuned! Alaska welcomes us to take photos together, after which we exchange thank you's and part ways. Enjoying our DragCon coverage? Follow @DerekPlease on Twitter, Facebook, Instagram and more.